This led to the establishment of the Desert Training Center (DTC) and California-Arizona Maneuver Area (C-AMA): 31,500 square miles, or 35 million acres, of desert in southeastern California, western Arizona and southern Nevada. Desert Training Center annexes an additional 11,000 square miles. Aug, 1943 Troops begin arriving in Bouse, Arizona. One trooper reported, "It was so hot, you could fry an egg in your hand." Apr 30, 1944 Desert Training Center land returned to Department of Interior and private landowners. Every year — on the second weekend in February — tourists, townspeople, and veterans gather to memorialize the now decommissioned Camp Bouse, a World War II army training site in La Paz County, near Parker, Ariz. About 10,000 troops were stationed here between 1943 and 1944 to train on a top-secret weapons program known as Project Canal Defense Light (CDL). First implemented by the British, CDL attached a strobe-like carbon arc lamp — basically a high-powered searchlight — to an M3A1 tank. Soldiers aimed the beam through a 2-inch slot in a specially fitted turret; special lenses changed light colors and range. Nicknamed “The Gizmo,” CDL effectively disabled the enemy by temporarily blinding them and causing disorientation. “It was the war’s second-most-guarded secret,” says John Bennett, Bouse Chamber of Commerce historian and La Paz County parks director. Leaking information on the CDL project guaranteed imprisonment or even execution, by virtue of the Espionage Act of 1917. Secrecy was facilitated by the camp’s desert remoteness in Butler Valley, surrounded by rugged mountain ranges (Gen. George S. Patton Jr. reported not seeing one inhabitant in four days). Furthermore, live target practice chased away gold miners; soldiers were prohibited from transferring out or leaving the camp unescorted; and townsfolk experienced regular blackouts. In the end, CDL never made it to D-Day and was only used to illuminate river crossings and provide security during night advances. General George S. Patton, Jr. led a reconnaissance party through the desert in 1942, reportedly stating he had not seen one inhabitant in four days. This led to the establishment of the Desert Training Center (DTC) and California-Arizona Maneuver Area (C-AMA): 31,500 square miles, or 35 million acres, of desert, Camp Bouse is an area several miles square located 20 miles east of Bouse. The most secretive, heavily guarded military units in the United States Army came to Bouse in March 1943 and left the end of April 1944. 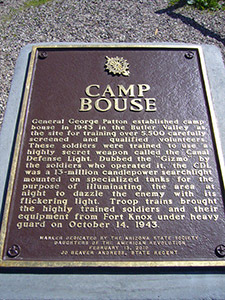 Camp Bouse was so extremely top secret, it was not listed with the dozen other training camps and to this day, historian/authors often miss Camp Bouse when writing about the DTC. Troop movement was extremely restricted -- once in Camp Bouse, there was no chance of transferring out. During the time it was operational thousands of troops from the 9th Tank Group occupied Camp Bouse. Commanded by Colonel Joseph Gilbreth and composed of the 701st, 736th, 738th, 740th, 748th Tank Battalions (medium special) 526th, (medium Special) Amored Infantry Battalion; 15th Station Hospital (150 bed); 554th Ordinance Heavy Maintenace Company (Tank); 166th Quartermaster's Battalion (mobile) Headquarters, 9th and 10th Headquarters, Headquarters Detachment; and the 629th Quartermasters Laundry (two sections) and including both American and British troops, . They tested a top secret weapon system mounted on top a tank turret known as the 'Gizmo'. Troops were told it would "change the course of the war." The Canal Defense Light (CDL) project was started at the request of the British military. Following a large scale slaughter suffered by British Troops by machine gun fire in WWI, a British officer proposed mounting a strobing searchlight on a tank that would allow advancing troops an advantage and blind the enemy defenders. The British considered American tanks better suited to handle the mounting of the `3 million candle power lights. The only successful deployment of the Gizmo came after the war, when British troops used them to quell riots in Calcutta in 1946. The last known surviving version of the British CDL turret mounted upon the M3 Grant Tank is located in India at an Amoured Corps Museum. A model of the Canal Defense Light (CDL) turret was built by Marty Sliva whose father served with the 738th tank Battalion, Company B at Camp Bouse and donated for display to the Bouse Museum in February 2012 --- just in time for the annual Bouse Days Ceremony. The real secret was not so much the weapon, but the strategy involved. Some who served at Camp Bouse believe they were left sterile from the powerful carbon arc lamps of Gizmo. Gold miners working active claims in the mountains around Camp Bouse were encouraged to evacuate -- usually a little over-their-heads target practice encouraged their departure. Even all the dogs in Bouse, 25 miles away, were rounded up and relocated. East of Hwy 72, drive north east on Main Street to the stop sign. Turn left on Rayder, which turns into Swansea Road. Go 2.2 miles to the Bouse Y trail head (look for the BLM information sign on the left) and continue on the Swansea Road (left fork). 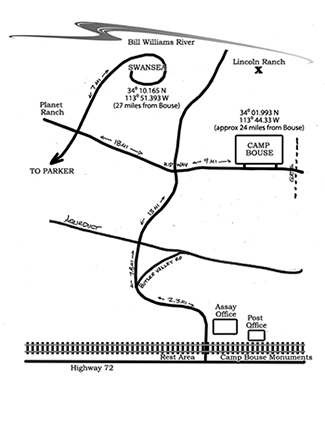 Camp Bouse is approximately 25 miles from Bouse, accessible by four-wheel drive or ATV. Passenger vehicles might make the trip, but there is deep sand along the way.